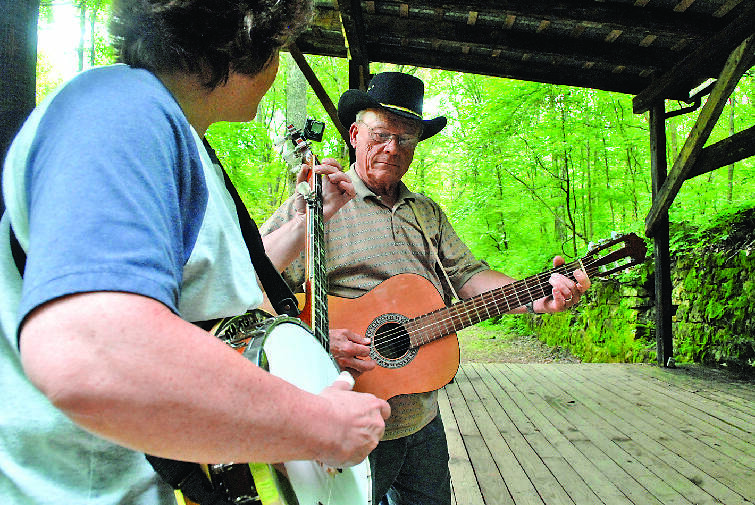 Jill Hudson, left, plays banjo while Ed Brown plays guitar on the amphitheater stage at the Historic Dunlap Coke Ovens Park. Sequatchie County and its county seat of Dunlap lie in the center of the Sequatchie Valley at the edge of the Cumberland Plateau, an area that has become a destination for retirees and nature lovers. "When people drop over the mountain from either direction for the first time, it's a breath-taking experience," Sequatchie County-Dunlap Chamber of Commerce Executive Director Winston Pickett said. "I think its scenic beauty is the No. 1 thing" about the area that strikes first-time and longtime visitors alike, Pickett said. The valley's beauty is rivaled only by "the people and their friendliness and their openness," he said. Many visitors from all over the country get their first taste of Sequatchie County in August during the World's Longest Yard Sale, which runs 675 miles from Gadsden, Ala., to Hudson, Mich. In Tennessee on U.S. Highway 127, the route tracks through Signal Mountain, Dunlap and Pikeville as it heads north. "It seems like the valley itself is a magnet," Pickett said. Arthur Atkins looks over a collection of items for sale at a shady lot near downtown Dunlap Wednesday afternoon, the day before the official start of the "world's largest yard sale" along a stretch of highway 127. -- Population: Sequatchie County, 14,171; Dunlap, 4,815. -- Best things to do/places to visit: The Dunlap Coke Ovens Park and Museum is a 62-acre park in the heart of the county where visitors can explore the remains of 268 beehive coke ovens used in the early 1900s to convert coal into industrial "coke," a product used to smelt iron ore. The Tennessee Tree Toppers is a nonprofit club of hang-gliding enthusiasts who make their home at Henson's Gap on Walden's Ridge in Sequatchie County. The site is home to the world-famous wooden, radial launch ramp, and also has campsites, a clubhouse, bathrooms and showers. -- Biggest employer: Sequatchie County Schools. -- Miles from Chattanooga: 42 via state Highway 111. -- Geographical features: Sequatchie County lies at the center of the Sequatchie Valley, which regional geologists say often is mistakenly called a "rift valley." The Sequatchie Valley was formed as water eroded what was once the floor of a shallow sea. The land between modern-day Walden's Ridge and the Cumberland Plateau's eastern escarpment had fissures in its surface caused by compression of the geologic plates that allowed water to gradually erode its way into the earth, leaving behind the valley and the Sequatchie River, according to University of Tennessee at Chattanooga geology professor John Mies' website. -- History: Sequatchie County was founded in 1857 from Hamilton, Marion and Warren counties. The name is linked with a Cherokee word "sequachee," probably meaning "opossum, he grins or runs," according to the Tennessee Blue Book. The name also comes from a Cherokee chief for whom the Sequatchie Valley was named. -- Most-famous residents: William Stone of Delphi, now called Daus, and James Standifer of Mount Airy both served in the U.S. Congress in the 1820s and 1830s. Dunlap-born Arthur Thomas Stewart was attorney general of the 18th Judicial Circuit of Tennessee, who served on the prosecuting team at the Scopes trial in Dayton. Dunlap resident Raymond H. Cooley, a staff sergeant in the Pacific during World War II, received the Medal of Honor for his courage and heroism during the 1945 invasion of the Philippines. -- Unique traditions: The Coke Ovens Bluegrass Festival held each June celebrates the connection of bluegrass music to the Sequatchie Valley's coal-mining past. The southern end of Sequatchie County near the Marion County line is home to the Sequatchie Valley Instititute, begun in 1971 as a family-based homestead on the escarpment of the plateau on the west side of the valley. Over the years, the site has become a learning center and model for sustainable living. -- Best-kept secret: Pickett Trout Ranch owner Steve Pickett revived the facility a few years ago. The trout ranch has been in the Cookston family for five generations and operated as a fishing attraction in the southwest part of the county from 1965 until 1981, then reopened in 2004.